AOTA Centennial Hill Day was a great success both nationally and at the Alabama state level. I (Rachel) had the honor of representing ALOTA at AOTA’s Hill Day as your ALOTA government affairs representative. If you aren’t familiar with Hill Day, it is an organized effort by AOTA to have a day on Capitol Hill where as many House Representatives and Senators offices as possible meet with OTs as we explain the distinct value of OT in our states as well as bring up key issues that are pertinent in the coming congressional sessions. AOTA really pulled out all the stops to make this centennial year amazing. We had over 600 OTs, OTAs, and students present from 45 states. Even Alaska had 2 representatives there! 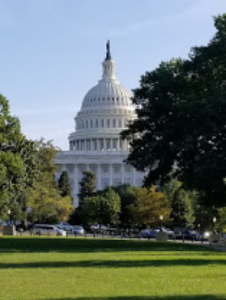 There was also the option of participating in Virtual Hill day where OTs, OTAs, and students were encouraged to call and email their representatives. The Home Health Flexibility Act. Currently, OTs cannot open a home health care case. This is inefficient for home health care teams, increases unnecessary healthcare costs, and delays clients from receiving OT. This would allow OTs to open a home health case, helping more clients return home safely and get the care they need. Repeal the therapy Medicare part B cap, a piece of legislation that has haunted us in the therapy world for over 20 years, and threatens to leave those with the most debilitating and significant levels of injury without the therapy they need to live their lives with independence and dignity. Funding for Title VII and Title VII which provides grants and programs for Health Resources and Services Administration (HRSA) and Behavioral Health Workforce Education and Training (BHWET). These programs are designed to address workforce shortages, including in the area of OT, specifically for veterans, seniors, children and families on low incomes, and rural communities. We had great meetings and feedback with all three legislative assistants and offices that we met with. I’d like to personally give Senator Shelby’s office a shout out for sharing some bottled water with us on an especially hot day in D.C. But, in all seriousness, it was an honor to meet with each office and I was incredibly encouraged by their willingness to consider these issues. I’ve been in contact with all the offices since leaving and am working to build relationships with the people we met with so that OT stays on their mind. All in all, I think it was a successful trip and I was honored to share the distinct value of OT and how we benefit the people of Alabama with our elected officials. Advocacy is important, it’s crucial to our profession and to the clients we serve. It was an honor to represent ALOTA at Hill Day.